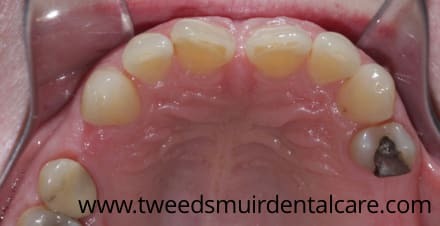 This patient was unhappy with the space between her two front teeth. She was also aware that the edges of her teeth had become more chipped recently. 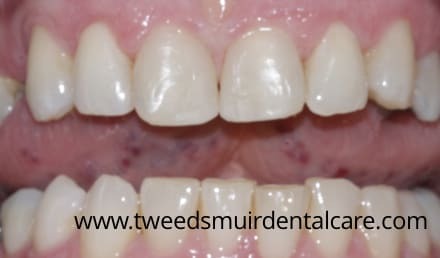 This case was completed in around 12 months using a combination of Inman Aligner and Clear Smile aligners. Both of these appliances were used to rotate the upper front teeth, resulting in the space between them closing over. 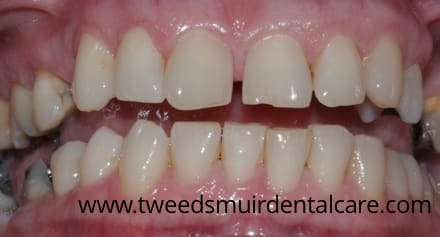 The case was then finished by adding white fillings to the upper front teeth to completely close the space and correct the chipped edges resulting in a much better appearance. The patient also had a wire retainer fitted behind her upper teeth to prevent them from rotating again. This treatment took slightly longer than planned so adjustments were made during the course of treatment to achieve the desired outcome. Why did you choose to attend our practice? The practice was local to me and is used by all the family. We have recently moved but we have no intention of going to another dentist. What was it that bothered you about your smile? I have always had a gap between my upper front teeth, however i recently noted that the gap was getting wider and the front right tooth was turning inwards. Why did you choose your dentist? How did you find the treatment process? The treatment process was long, longer than expected, however the end result made up for the length of time it took for my teeth to look as good as they do. A few minor adjustments along the way made all the difference to the result. The treatment was uncomfortable. Due to the style of brace it didn’t fit round my teeth, it had a bar across my upper palette. This was more of a nuisance than a discomfort and it was difficult to talk and make myself understood at times however perseverance prevailed. Are you with the result? Has your life improved since the treatment ended? Absolutely. The practice is very friendly and welcoming. From the minute you enter through the front door to when you leave, everyone welcomes you, usually with your first name and will help you out as much as possible in making appointments to suit your schedule. The help, advice and services they provide are always good. It’s a very busy practice. I think the fact that I, my husband, my 2 daughters, their husbands and children all go to this practice is an indication of how good it is. I certainly have no plans to go elsewhere.